When social media came into existence, it was the best tool ever which helped individuals to get connected. In that manner Facebook, twitter and LinkedIn were few famed ones where LinkedIn was the apt one for professional reasons. The following mentioned are few tips on how to stalk people on LinkedIn platform. Stalking is a famed term in LinkedIn. The most used area in LinkedIn is to find out ones who have already viewed your profile. Stalking is something where you need to get to contacts, find contacts of someone who can help you. Clever and resourceful ways are required to find them. For job seekers who desire to make their application stand out of the rest, an insider access of the company contact, email address and more are required. With LinkedIn, contacts can be organized in a non-creepy way and information can be gathered. A job quester should get to LinkedIn first and make a quick research about the organization name before applying for an online job post. You can find someone associated with the company in your extended network. When you find such a contact, a conversation can be initiated instantly. It is annoying when you really ambush a person with your resume. Instead, a conversation with a few questions about the company can be great. By this way, a rapport is developed, and you can gain more details about the hiring manager. In this manner, you’re able to get a referral from your internal source. This is one way by which stalking people with LinkedIn can be achieved. It is mandatory to follow people around you instead of sending a resume directly to the hiring manager for a job. The main intention here is to have a conversation. Never can an individual just request to a hiring manager that he needs to get linked. Instead, the person should find someone who is already linked to the company and make you also a contact with that person. Once you have spotted a hiring manager that you have been looking for your job reason, open up her profile and get to know the groups she is a member of. If you’re not a member of any of her group become a member of one of her group. Start a conversation that you’re also a member of so and so group, which has more power. Stalking someone can be thus done in LinkedIn. LinkedIn is the best source which can help you to know more about the interviewer you’re going to meet. Take a look and read through the profiles of ones you’re about to meet. Make a note of some good points and questions so that you can speak in an interview. It is good to do a good homework before making a rapport with the interviewer. The person’s company bio can also be read where LinkedIn trolling along with Google search can be done. You can also get something inside the scoop with the help of LinkedIn for an interview. It is always suggested to unearth few vital facts which can link you in some way. Stalking people is hence is a good way to reach what you need. Getting linked with the interviewer is something important for job seekers with the help of LinkedIn. But job questers should also make sure that they do not go crazy with each and every single update and status. By this way, you will be familiar in the circle and also be a laugh in the cube. Since LinkedIn is a professional networking site, it is important to think numerous times before you like and share. Connection will be able to see what you like and share and hence one should be conscious. Individuals should avoid liking disgraceful images and use common sense for liking and sharing any post. This is important because this can be a reason for you to get blocked. There are also anonymous LinkedIn stalking tips to stalk people on LinkedIn so that your profile is kept anonymous. Do not just initiate by sending odd messages for getting started for a career. Bring out the commonality amongst both of you and start the conversation. Do not start off straight away that you require a job. This can be considered as an odd and unprofessional way of introduction or conversation. Conversation should be started from the relationship in this scenario. Hence there are many ways to stalk people on LinkedIn. Every time you see someone’s profile on LinkedIn, your name, location, industry and job location can be viewed along with an option to get connected. Go to privacy settings which are positioned on the drop down of the top right hand corner of the page and click on Manage. Now click on “what others see when you’ve viewed your profile”. Now select the option “you will be totally anonymous”. By this way, your profile is made anonymous. The best part of LinkedIn is that you can find out people who have viewed your profile. The name, industry, location and job title of the person can be viewed and you can also get connected with that person. 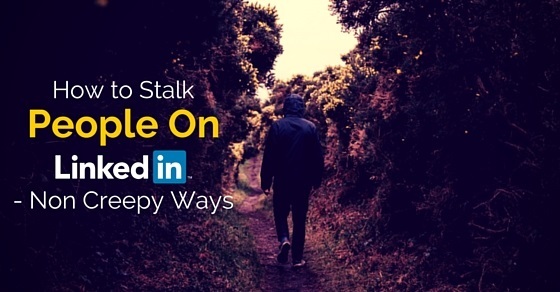 By this way stalking people on LinkedIn in non-creepy ways can be achieved. The above mentioned are few tips which can be very useful for job seekers to obtain their job easily. For ones who need real access especially who are hunting for jobs can make their application stand out of the rest, by ways of stalking with others on LinkedIn can be beneficial. Next articleWinding Career Path – How to Explain in Interview?